Sunken slabs are used in the toilets, bathrooms and washing place where we have our washing machines. 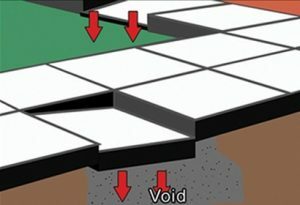 The purpose of having a sunken slab is to conceal all the pipes below the floor. The concrete of the R.C.C. (floor and sunken slab) should mixed with a waterproofing material to get a denser, watertight concrete. Then cement and waterproofing material should be diluted in water and splashed onto the RCC sunken slab. Over that a layer of plaster should be provided using a mortar plasticizer with the cement mortar. Brick laying of walls and plastering (prior to tiling) of the walls and floor should be done with cement mortar mixed with a mortar plasticizer. Tile fixing for the floor and walls tiles should be done with non-shrink, waterproof tile adhesives to make the tiled area waterproof. Sanitary pipe joints should be sealed with sealants specially manufactured for Sealing Sanitary joints firmly so that no water can leak through. ← What is segregation of concrete?